Banana Beach Resort is touted as the world's only beach resort within a banana plantation, and it is located in Tagum City, Davao del Norte, Mindanao, Philippines. 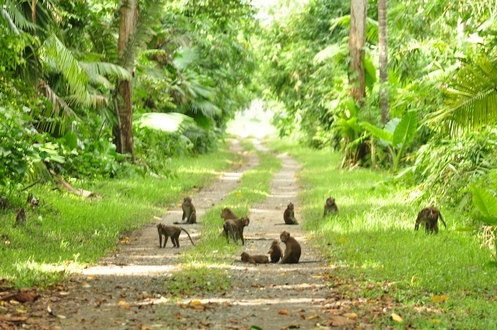 The resort is nestled within a sprawling 760-hectare banana plantation owned by Hijo Resources Corporation. Its coastline beach spans 4.5 kilometers of a flat and even seabed, which provides guests with popular water activities such as kayaking, skimboarding, banana boat riding, beach volleyball, water trampoline, Frisbee throwing, or simply building sand castles. 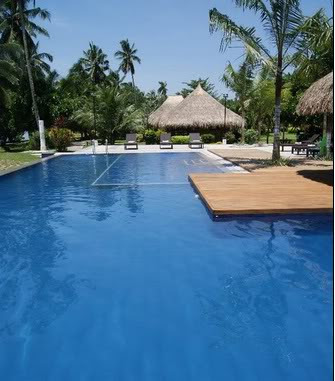 Hailed as the most child-friendly resort in Tagum City, swimmers are always in the constant watchful eyes of the Resort's lifeguards who are strategically situated in the beach area. 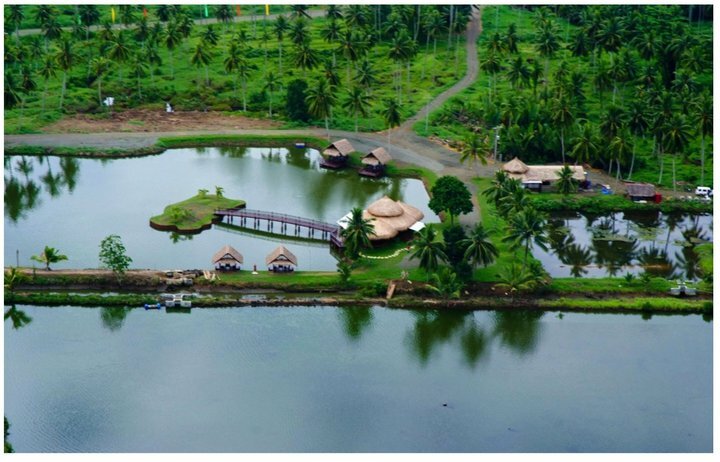 It also has a 60-hectare forest, a playground for children, and a "Spot" where guests can do fishing, and a trail for biking and horseback riding. 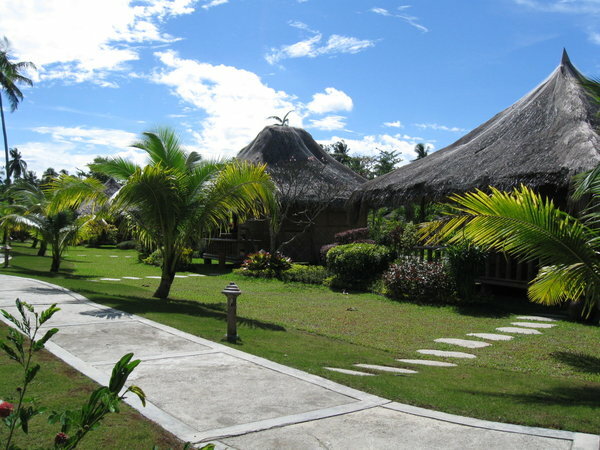 Clustered a few steps from the beach are tropical-inspired cottages, two of which can accommodate up to 25 persons each, and seven smaller huts which can seat 10 persons each. The Resort charges a nominal entrance fee for each guest which is fully consumable on food and drinks at the restaurant and bar, but exclusive of rentals for water activities, accommodation, and other amenities. Senior citizens get a 20 percent discount, and children under 12 years old are free of entrance but must be accompanied by adults. There are two big day cottages which can accommodate up to 50 persons and seven smaller huts with a maximum capacity of 15 persons. There are also 10 tables which can seat six persons each. 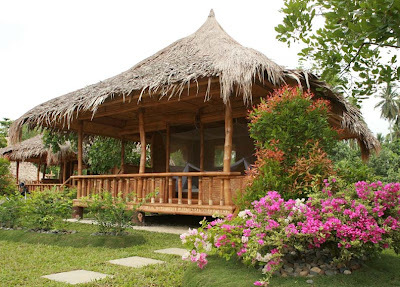 For overnight stay, the Resort has several Casitas which resemble a traditional "bahay kubo" but are open like a cabana : Single Casitas which can accommodate two guests, and seven Family Casitas which can house four guests. Each of the Casita is provided with one to two mattresses and includes a mosquito net for protection. The toilet and bathrooms, however, are for common use: one for men and another for women. 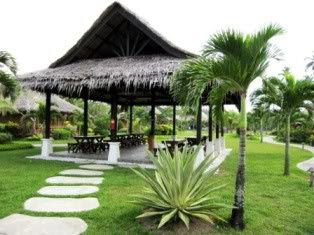 At the center of these Casitas is an open cottage for dining, meetings, and parties which is surrounded with lush ornamental and flowering plants of various breeds, colors and sizes. The Pool features a sunken bar with seats submerged in the water. Guests can swim and at the same time enjoy refreshing tropical drinks or cocktails while lounging at the sunken bar within the pool area. 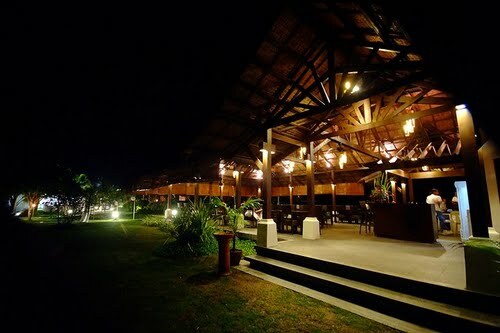 "The Spot" is the most popular place in the Resort where guests can fish for bangus, kitang, lapu-lapu, talakitok, and pompano. It was named as such because guests will have to find their "spot" to do their fishing. It has a huge pavilion where guests can feast on their prized "catch-of-the-day" and other local delights while enjoying the view of the pond, mangroves, and the Madaum River. 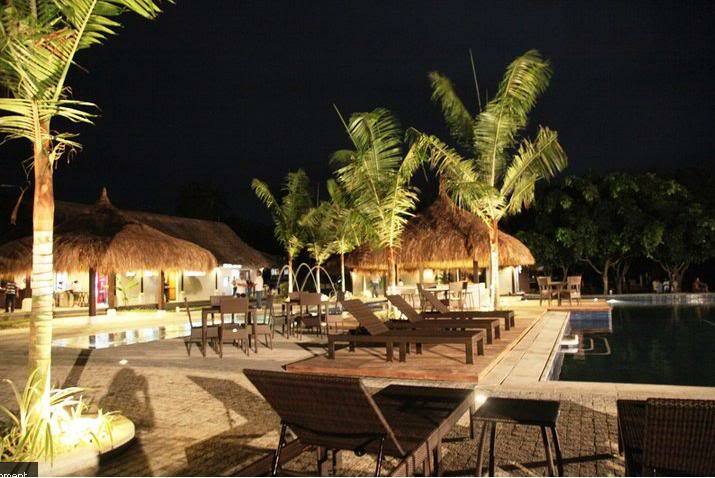 It is ideal for business events and social gatherings such as weddings, family reunions, debuts, and birthday parties. Smaller huts around "The Spot"
Aerial view of the "The Spot"
Not far from the beach is a sprawling 60 hectares of lush forest of trees, bamboos, giant Anahaw trees, and some species of rattan. Guests can avail of a guided tour called the "Twilight Safari" aboard a touring cab provided by the Resort that includes a perimeter survey of the forest where monkeys, wild boars, snakes, monitor lizards, heron, egrets and other birds roam freely. The guided tour is from 5:30 AM to 9 PM. 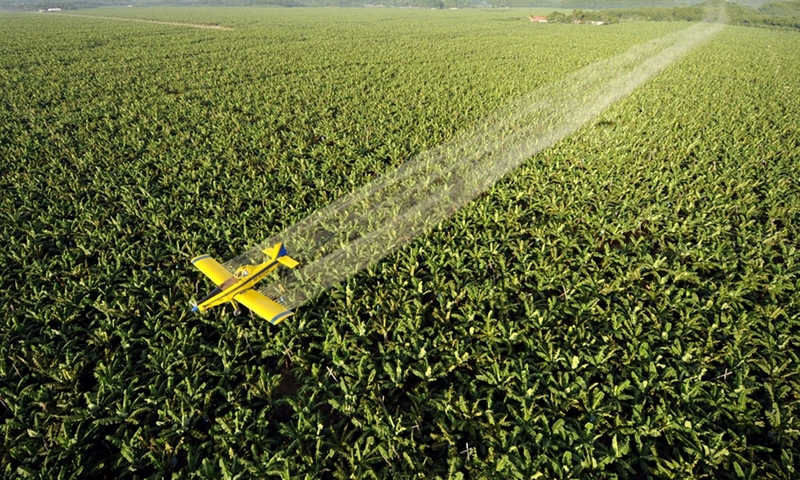 Or, a tour of the Banana Plantation where guests will have an opportunity to learn the science of banana planting and processing, including a brief history of how the Hijo Plantation started and became the first plantation in the country to export bananas to Japan. 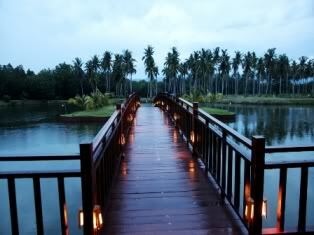 The "e-Walk", or the elevated walk, is the newest forest attraction in the Resort. It is a series of about eight hanging bridges, 22 to 25 meters long each, that are interconnected to huge Dao trees with a ground elevation of about 10 meters. 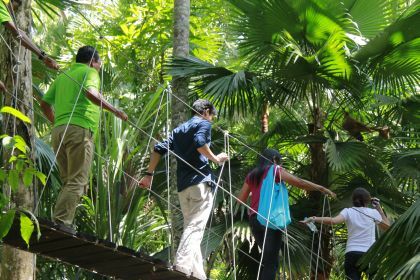 While treading along these hanging bridges, guests will enjoy a scenic view of the inner forest where various animals and wildlife creatures roam freely about. The Resort is located at Barangay Madaum, about 15 minute drive from Tagum City, Davao del Norte, or an hour away from Davao City. Thanks for the info! I've been looking into Big Sur resorts and Post Ranch Inn is my favorite so far -- the views seem amazing. Thank you for your comments. I hope you will drop-in again for fresh posts and updates. Hi Levi Jane Vidal, the resort charges P500 per person which is valid only for one day and is fully consumable on food and drinks at their restaurant and bar, but is not applicable for rentals, accomodations, and other resort amenities. Senior citizens and residents of Tagum City only pay P400 per person. Children under 12, however, are free of charge but must be accompanied by an adult. There are about seven comfortable small huts which can easily accomodate up to 15 guests. 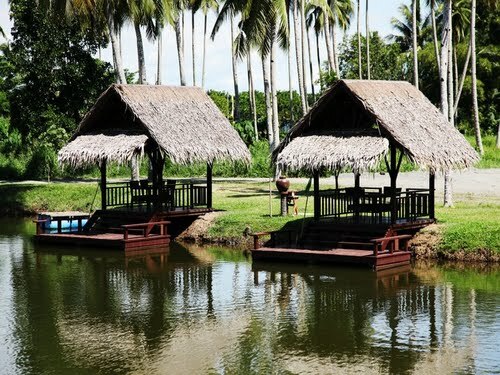 For further inquiries on the cost of rentals of these huts, you may call their Numbers +63918-452-1849, +63917-633-7000, and (+6384) 400-3358, or you may visit their website indicated above. Thank you. 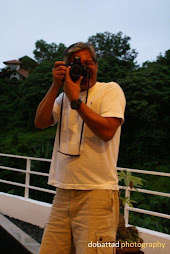 Hi Anonymous, I do not usually indicate the rates in my blog as they do change from time to time. However, when asked about the rates, I usually obtain the info from their websites, or provide the latest rates as I recall when I was there last. Banana Beach Resort should have the correct and current rate, of course. Thank you. wow looks like a great place to visit! I really love the view of the pool, looks so sophisticated. thanks for the great post you've got. just wanted to ask of all the possible prices of the cottages and and entrance fee for adult, i tried to call the number u post but said "the number cannot be completed" so would u give me another smart number so i can call and ask some questions before i book, i have plan to visit on holiday next month,. any other fun such as diving? snorkling? 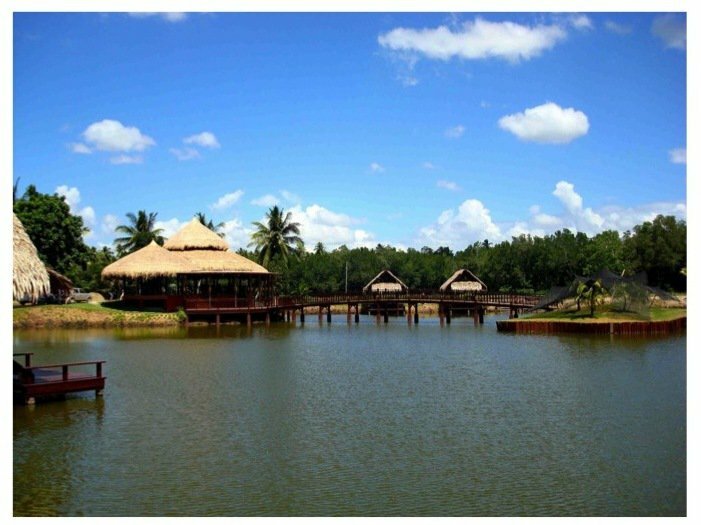 Aside from water sports activities, guests can also do fishing, biking, or horseback riding. hi! 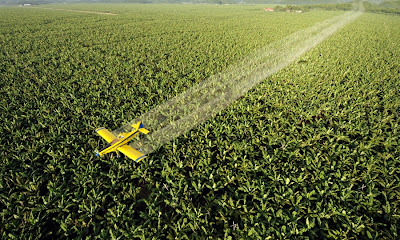 a group of HS students specialized in agriculture wants to have a field exposure in your area.what other plantations are there except for the bananas & what activities? 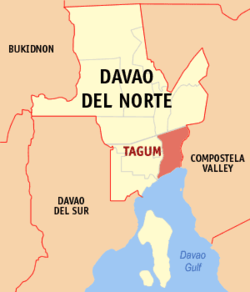 Tagum City is predominantly an agricultural province, and produces various crops like coconut, rice, banana, fruit trees and other agricultural crops. It is best that at you approach the city government to best address your requirement. God bless. if we're going to stay there for overnight how much is the additional payment? how much is the payment if we are going to stay there for overnight? Is der any tel no. 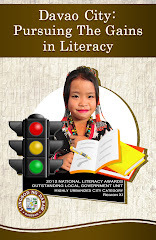 Her in Davao city area?? may I know please the rates of the facility for overnight stay,are there any promo packages you can share yo us? Just drop in to this site, and im fascinating w/ the views,..want to visit here,.just wanna know the rate for overnight stay? magkano po ang package sa wedding? I do not have the info on wedding packages but you can refer to the resort's website: www.bananabeachdavao.com for further info. wow looks like a great place to visit! I really love the view of the pool,ground,rooms of hotel looks so sophisticated and royal.thanks for the great post you've got. Do they have the mangrove river cruise?